The Presidents of the United States and Turkey have recently been exchanging barbs—and economic sanctions—over an evangelical missionary imprisoned in Turkey. The usually bustling open market in the Kadıköy district of Istanbul was half full on Sunday. Shop owners had increased their prices twenty per cent over the past two weeks. The cost of a package of eggs had risen by fifty per cent in a week; the price of bananas imported from Latin America had doubled. Aynur Keskin, a homemaker with two school-aged children, bought a few items and shook her head, dismayed at the rising inflation, a result of the country’s ailing economy and the plummeting Turkish lira. “I was thinking of going abroad for a holiday, but that’s a dream now,” she told me. Mesut Taşkıran, the owner of a Kadıköy grocery store, told me he has started hoarding money and limiting his personal spending. “If things continue to go higher, we might have to shut down,” he said, referring to his shop. For years the Turkish economy has been on a downward spiral, due to burgeoning international debt and Turkish President Recep Tayyip Erdoğan’s policy of keeping interest rates artificially low. 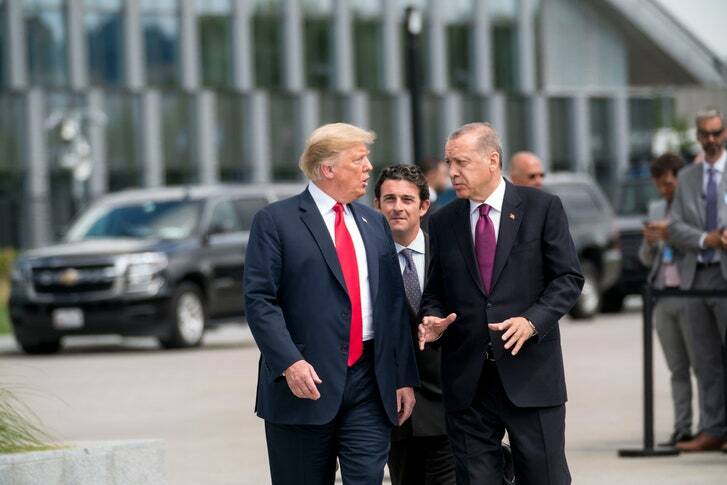 In the last several weeks, a dispute between Erdoğan and President Donald Trump has accelerated a drop in the value of the Turkish lira, which fell to a record low on Monday of 7.24 to the dollar. (A year ago, a dollar could buy three and a half lira; two years ago, three). By the end of the day Wednesday the value had rebounded slightly, but investors, business leaders, and Turkish government officials still feared that the economy might crash. Erdoğan and Trump have been exchanging public taunts—and economic sanctions—over Turkey’s two-year imprisonment of Andrew Brunson, an evangelical American missionary accused of espionage, links to terrorist groups, and involvement in the failed Turkish coup in 2016. Brunson, who faces up to thirty-five years in prison, has denied the charges. On July 25th, Turkey moved Brunson to house arrest, a concession that Trump deemed inadequate. The following day, in a tweet, Trump announced that “The United States will impose large sanctions on Turkey for their long time detainment of Pastor Andrew Brunson, a great Christian, family man and wonderful human being.” A week later, he implemented sanctions against Turkey’s justice and interior ministers, freezing their U.S. assets and barring them from doing business with American citizens. Turkey responded by sanctioning the officials’ American counterparts, before Trump announced, on Friday, in another tweet, that the U.S. would be doubling its tariffs on Turkish steel and aluminum. Brunson has lived in Turkey for more than two decades, doing missionary work and running an evangelical church in the coastal city of Izmir. He was detained on charges of being linked to both Fethullah Gülen, an elderly Islamist cleric, living in exile in Pennsylvania, whom the Turkish government accuses of masterminding the failed coup, and the Kurdistan Workers’ Party, or P.K.K., a separatist group that has battled Turkish forces in the country’s southeast for nearly thirty-five years. Erdoğan has repeatedly demanded that Gülen be extradited to Turkey, but the Obama and Trump Administrations, in concert with the Justice Department, have said that Turkey’s evidence against him is insufficient. Turkish officials have expressed surprised at how important Brunson is to the Trump Administration, considering that several other Americans, including the nasa engineer Serkan Gölge, are also jailed in Turkey. Turkish officials suspect that Trump and Vice-President Mike Pence, who have strong political support from evangelical Christians in the U.S., believe that Brunson’s release could increase Republican voter turnout in the midterm elections in November. “Given the highly visible role of Vice-President Pence, the Turks believe there was a political calculation about garnering more of the evangelical vote,” Bryza said.